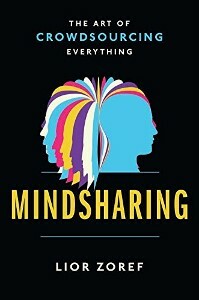 I had never heard of Lior Zoref until he offered to send me a copy of his book, Mindsharing: The Art of Crowdsourcing Everything (New York: Portfolio/Penguin, 2015). One story and I was hooked–to demonstrate the collective wisdom of a crowd, Lior brought a live ox on stage as part of a 2012 TED talk and asked the crowd to guess its weight and send their answers on their smart phones. There were more than five hundred estimates from the crowd. The lowest was 308 pounds. The highest was 8,004 pounds. Who thinks that an ox weighs 8,000 pounds? (Apparently four different people in the audience did.) When I was handed the envelope on the TED stage, I was so happy and relieved to see the results. The ox’s real weight was 1,795 pounds and the average from the crowd was 1,792 pounds. No single person knew the weight of the ox, but together the crowd was as smart as any ox farmer in America. Crowd wisdom worked a hundred years ago, it worked for me on the TED stage, it worked for me in creating this book, and it can work in your life as well. Of course, I was skeptical, so the first thing I did was to look online for Lior’s original TED talk, but unfortunately it hasn’t been published yet (and why not? I wondered, still wearing my skeptic’s hat). Still, I kept reading–no devouring–the rest of Lior’s book about how social media can function as a crowd source of intelligence, wisdom, and creativity. The book offers plenty of examples, from the way Lior crowdsourced his TED talk and his book, to the experience of others who asked their own social media crowd about relationships, parenting, health issues, and following their dreams. Lior is obviously enthusiastic about mindsharing and its potential, but he also frankly discusses some of the pitfalls, limitations, and ways that it doesn’t work. Mindsharing is no substitute for consulting with experts in various fields–as a former Microsoft vice president and now researcher in the area of crowdsourcing, Lior himself qualifies as an expert–but Mindsharing persuasively demonstrates that a crowd of nonexperts can be an added source of wisdom and support. You can learn more for yourself by downloading and reading two free chapters of Mindsharing as part of Lior’s book launch. As for me, I’m heading over to Facebook to see if my network of relationships can help me with a question that I’ve been pondering lately, and I’ll let you know how that turns out. . . .
Disclosure: When Lior offered to send me a copy of his book, I said yes. As in all my reviews, my opinions and healthy skepticism 🙂 are my own. Your turn: Have you ever turned to your social media crowd for advice on what to read or write next, where to go to school, find a job, or some other question? How did it work–or not work–for you?